A Booklet or leaflet is one of the most popular types of advertising tools today. In this article you will learn about how to make an advertising booklet, what types of booklets exist, as well as how to choose the right booklet format and how to make a beautiful design. "Booklet - commercial offer" - in fact - is a classic commercial offer, which we talked about in the article "How to write a business proposal". 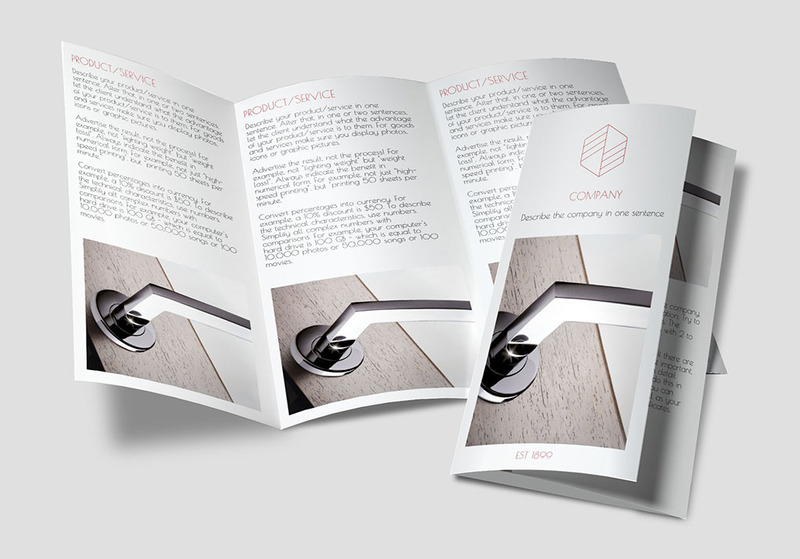 "Booklet portfolio" - In this case, the goal of the booklet is to display the products or services of the company in the most attractive way. All prices and terms of cooperation are attached to the booklet, such as price lists or commercial offers. The basis of the booklet-portfolio should be images of products or services and a text description. Be sure all images are in high quality and resolution. Images can be downloaded from photostocks, read article "Images selection", or made by your own photography. The choice of booklet format depends on the amount of information you are going to place on it, and how convenient it will be for your customers to store or carry the booklet. Therefore, the most popular format, in our opinion, can be trifold - an A4 booklet with two bends (a Leaflet). This size corresponds to the European format and is placed in the "euro"envelope. It is convenient to carry in a case, folder, handbag or in your hands. Booklets can have one or several folds, and can be folded in various ways e.g. accordion or z-fold. The number of folds and the method of folding significantly affect the appearance of the advertising booklet, so special attention should be paid to the layout development. A Booklet with two bends is made on A3 - A5 paper. The leaves can be folded lengthwise or crosswise, or folded inward like an accordion. Booklet with 3 bends is made on A1 - A3 paper and folded across, accordion, with a parallel internal inversion or three counter bends. On the Wilda online builder, you can create booklets in the three most popular formats: A4, A5 and A6. The places to fold will be designated by special markings. In terms of the leaflets with folds, make the cover attractive, so that your client would like to read on and view the entire leaflet. On the inside, place the basic information. On the reverse side, you would usually print your contact details, address, website and E-mail. All materials, texts and graphics contained in the advertising leaflet must be aligned to be equally attractive in a folded and unfolded form. A booklet created on the Wilda online builder may be printed in a printing house, if it has been downloaded into a PDF format. PDF is a vector format, so it scales well without losing quality. In addition, it can be edited by professional design programs such as Adobe Illustrator. JPEG format is not suitable for printing, so documents in this format can only be viewed on the monitor without losing quality. This format is ideal for sending a preview document to your colleagues or business partners, or customers in an e-newsletter offer. Before printing your booklet in large print runs, you should do color tests, as the colors may vary slightly from those you see on your monitor due to its individual settings.